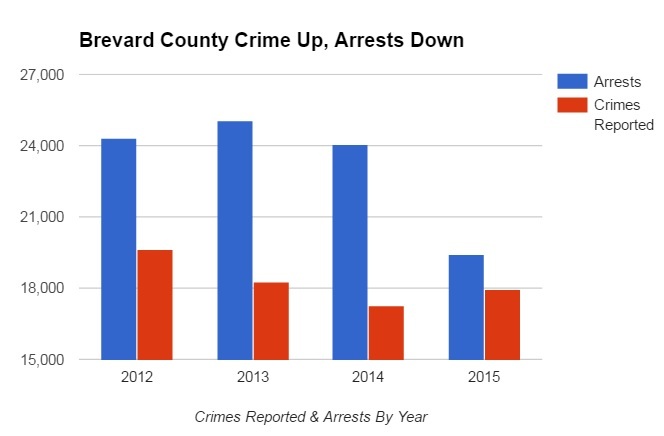 BREVARD COUNTY, Florida - Brevard County had more crimes reported and fewer arrests made in 2015 when compared to 2014, according to the Florida Department of Law Enforcement's Annual Uniform Crime Report released on Friday. The number of crimes rose 4.0% on Florida's Space Coast, bucking the overall -1.6% statewide decrease in crime in 2015. Although 691 more crimes were reported in Brevard County during 2015 than in 2014, local law enforcement agencies made 4,632 fewer arrests or -19.3%. 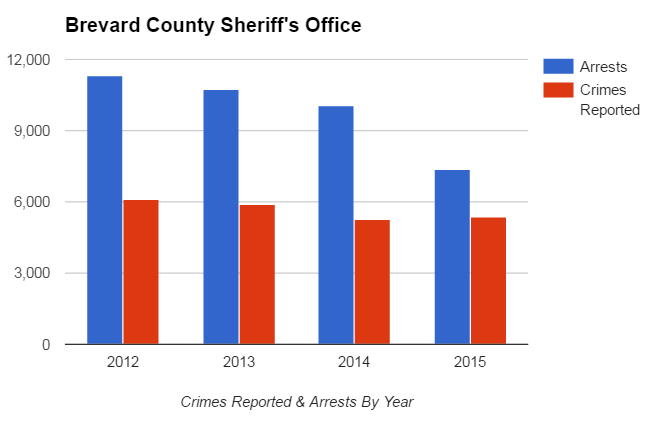 The Brevard County Sheriff's Office saw the biggest drop with 2,670 fewer arrests in 2015 than in 2014, down -26.54%. During that same time period, the number of crimes reported in BCSO's jurisdiction rose 2.19%. The fewer arrests trend for BCSO becomes even starker when 2015 is compared to 2012. BCSO made over one-third less arrests (-34.65%) in 2015 (7,389) versus 2012 (11,307). 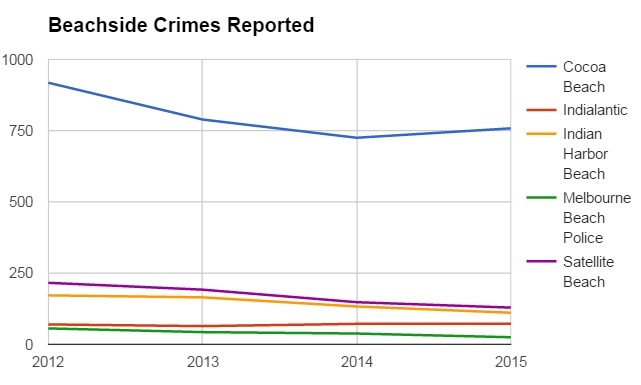 However, it should be noted that the number of crimes reported in BCSO's jurisdiction also dropped by 12.18% (-744) over that four-year period. 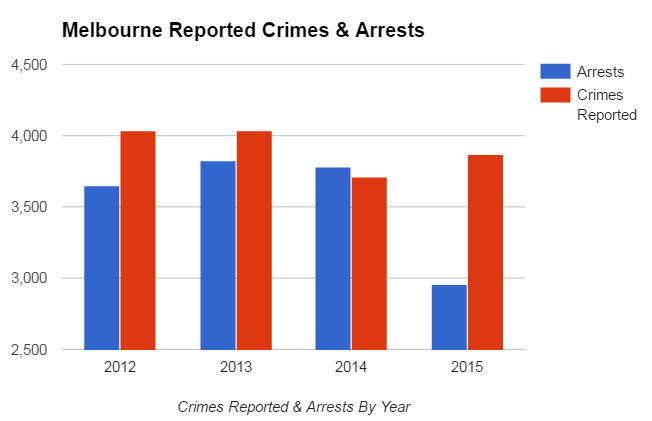 The City of Melbourne had the second biggest drop with 819 fewer arrests (-21.68%) while the number of crimes reported (155) rose 4.17% when comparing 2015 to 2014. Over a four-year period, Melbourne Police made 18.89% fewer arrests in 2015 than in 2012 while crime only declined -4.07% during that same time period. 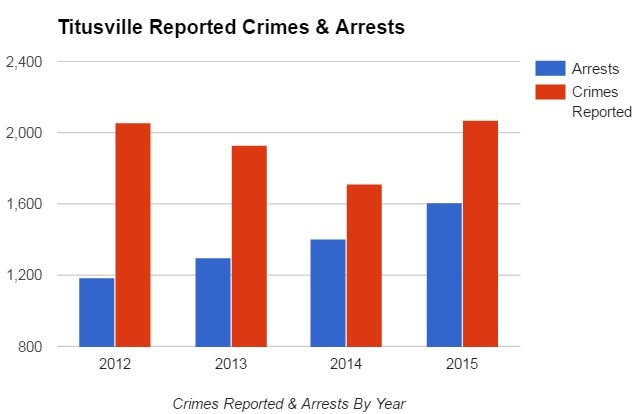 In contrast to BCSO and Melbourne P.D., the Titusville Police Department made 14.53% more arrests in 2015 than in 2014 while the number of crimes has remained virtually unchanged from 2012 to 2015. The Palm Bay Police Department made 9.56% fewer arrests in 2015 than in 2014 while crime also dropped -9.13%. The number of Palm Bay P.D. 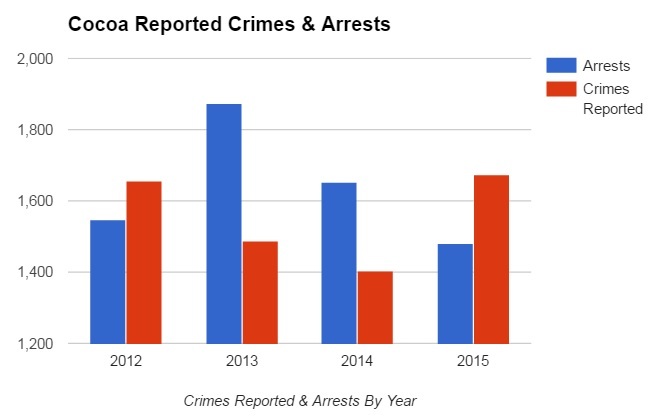 arrests made in 2015 have only dropped slightly (-4.20%) when compared to 2012 and the number of crimes dropped -14.68% during that four-year period. The Cocoa Police Department made 10.41% fewer arrests in 2015 than in 2014 while the number of crimes spiked up 19.33%. When compared to 2012, Cocoa P.D. 's number of arrests and crimes reported remain essentially unchanged at -4.45% and 1.09%, respectively. Small beachside towns on Florida's Space Coast have too small of a population for statistical significance, making year-by-year percentage comparisons unwarranted. 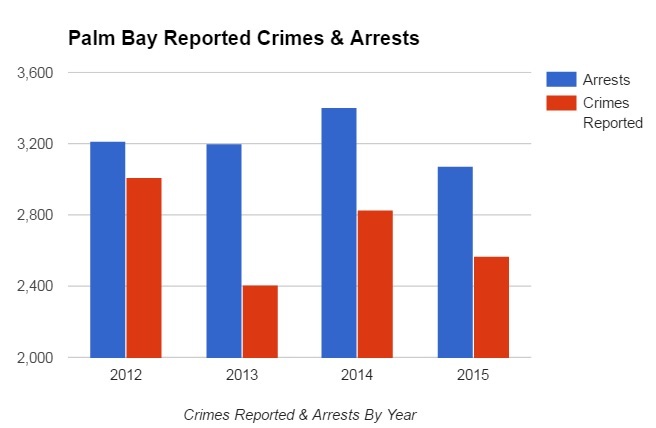 All beachside towns have seen a general decline in arrests and reported crimes over the last four years.